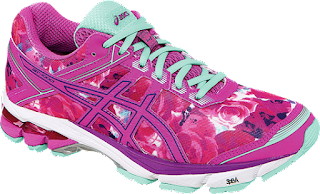 ASICS continues in the fight to find a cure for Breast Cancer with it's range of limited edition, women's running, and training shoes. Today we highlight the lightweight ASICS GT-1000 4 Pink Ribbon Sneaker, the 4th version of the GT-1000, updated with a new upper built with engineered mesh, benefiting the About Right Action for Women charity, established by Actress and Advocate, Christina Applegate. The above all-pink sneaker in pink glow/hot pink/pink ribbon (which also comes in black) boasts an all-over roses print, a weight of only 9.3oz, ASICS's DuoMax® Support System for enhanced support and stability, a smooth and cushioned ride thanks to the bouncy material of the SpEVA® Midsole, enhanced gait efficiency and midfoot structural integrity thanks to its Guidance Line®-integrated Trusstic System construction that's excellent support for mild to moderate overpronators, an Impact Guidance System (I.G.S®)to enhance the foot's natural gait from heel strike to toe-off, and as with all ASICS running shoes, Rearfoot and Forefoot GEL® Cushioning Systems to reduce the force of shock during impact and toe-off.